The Criminal Prosecution Division prosecutes Class C misdemeanors pursuant to state laws and city ordinances. 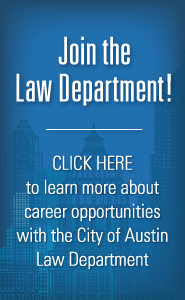 The attorneys in this division practice before the City of Austin Municipal Court and cover an average of 60 dockets per week including jury trials, bench trials, and pre-trial motion hearings. Prosecutors pursue approximately 430,000 cases a year submitted by City of Austin departments including Police, Code Compliance, Development Services, Water, Animal Services, Fire, and Health. The Financial Services Division provides financial planning and budgeting for the City of Austin Law Department, including business planning, purchasing and outside counsel/consultant contracting. The General Counsel Division provides advice and counsel to all City departments and operations on employment, labor relations, and civil legal issues. This includes risk analysis and risk mitigation advice; compliance with employment and labor relations standards; assistance with drafting and interpreting policies, procedures, and other documents; and representation of City management in civil service appeals and in external administrative claims involving employment, labor relations, and civil service issues. The Land Use and Real Estate Division provides advice and counsel to specific City departments including Planning and Zoning, Development Services, Watershed Protection, Real Estate Services, Austin Water-Wildlands Conservation Division, and Public Works Capital Contracting Office, as well as support for the Parks and Recreation Department. The General Litigation group defends the City of Austin and its employees in all civil litigation cases. The types of cases managed by the General Litigation Division include civil rights, contract disputes, personal injury, employment, and land use matters. The Municipal Operations Division provides legal advice and opinions to City Council and City Staff on municipal finance issues such as public finance, bonds, taxes, fees and budget and other municipal services such as parks, animal services, and the library. The attorneys also provide transactional assistance to multiple City departments such as Purchasing, Health and Human Services, Aviation, Convention Center, Economic Development, Controller, Financial Services, Transportation, and Housing. Cindy Crosby is the Municipal Operations Division Chief. The Open Government / Ethics and Compliance division provides legal advice and ethics training to City employees, boards and commissions, and elected officials. Intended to serve educational purposes, the division does not conduct investigations nor give advice to members of the public. Depending on the matter, the Auditor's Office or the Human Resources Department handles investigative and disciplinary action. The Utility and Regulatory Division handles utility, regulatory and franchise issues as well as general legal issues for Austin Energy and the Austin Water Utility.